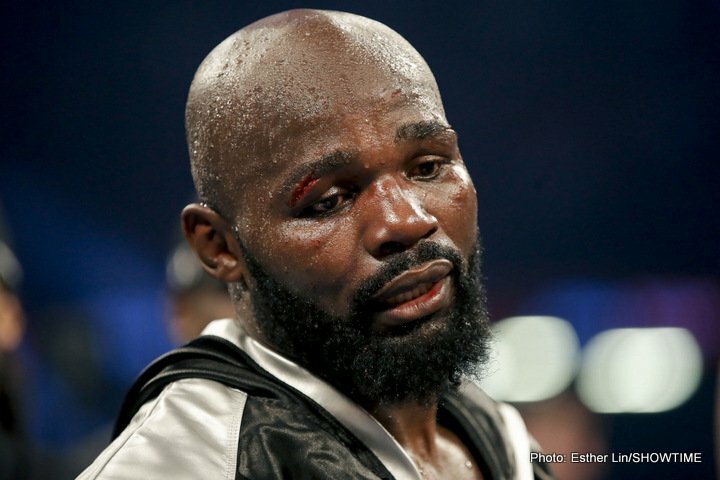 What next for Carlos Takam? The hero of the hour in terms of the heavyweight division, France’s Carlos Takam made one big name for himself in defeat on Saturday night in Cardiff, Wales. The huge betting underdog (Takam was a 40/1 outsider on some boards) put on one helluva gutsy, admirable showing against the younger, bigger, stronger and harder-hitting Anthony Joshua. Battling on for round after round despite being quite horrifically cut over one eye and badly cut over the other, Takam, 35-4-1(27) refused to quit and take his guaranteed pay day when he could so easily have done so. In so doing Takam may well have earned himself not only a place in the hearts of fight fans, but also a number of possible big fights down the road. Now a confirmed fan favourite, Takam would prove a hugely attractive foe for a number of name heavyweights. Assuming he suffered no career-ending injuries or punishment during the war with AJ, and after he’s had a long rest allowing his cuts to heal, Takam could be back in a big fight next summer some time. Takam is no spring chicken at age 36 (Takam turns 37 in December) but he could bag himself a couple of well-earned pay days before he’s ready to walk away. Takam would be most welcome back in the UK and if Whyte cannot secure a shot at WBC king Deontay Wilder, maybe this one would be a fight Eddie Hearn would look at making next summer. Assuming the older man didn’t take a career-ending hammering from the reigning WBA/IBF champ, Takam-Whyte could go either way. “Big Baby” is gunning for a title shot and, after he gets past Mariusz Wach (who he faces on November 11) Miller, if he hasn’t secured a shot at one of the three champions, might be enticed to box an eliminator against Takam. This fight would very possibly tell us a lot more about the unbeaten big man from Brooklyn. Fury, still understandably disgruntled over the decision that went against him after his WBO title shot against Joseph Parker, needs to get back in action sooner rather than later and, assuming he is healed by then, Takam could make another trip to these shores to tackle the cousin of the former world champion. A great clash of styles, Takam-Fury would be very, very interesting. Takam will almost certainly fail to get the rematch with Joshua he is calling for but there are plenty of other big fights out there for the man of the hour. You are here: Home / Boxing News / What next for Carlos Takam?